Following the recapitalisation of banks undertaken by the government, the banking sector’s share in the flow of credit increased sharply in FY18. 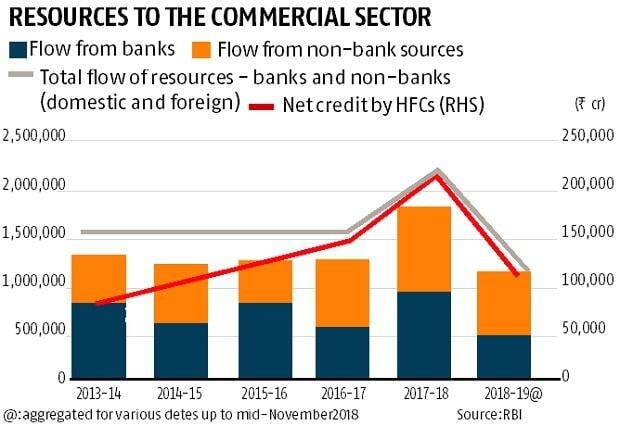 However, in FY19 (till mid-November), the relative proportion of domestic banks’ share in the flow of credit and that of non-bank resources was almost evenly matched, said the financial stability report of the Reserve Bank of India. Moreover, the report mentions that with regard to the flow of resources from domestic non-bank sources, the share of net credit of housing finance companies (HFCs) in the total flow of credit nearly doubled from 6.2 per cent in FY14 to 11.7 per cent in FY18. The share of foreign resources in the total flow of credit to the commercial sector was between 16 and 19 per cent, with foreign direct investment (FDI) being the dominant contributor. However, in the financial system, asset management companies-mutual funds (AMC-MFs) have been the largest provider of funds with gross receivables of Rs 8.34 trillion in the period ending September 2018 followed by the insurance companies which have gross receivables to the tune of Rs 5.09 trillion. Schedule commercial banks, non-banking financial companies (NBFCs) and HFCs have been the top recipients of funds from AMC-MFs and insurance companies, the report mentions. NBFCs, on the other hand, were net borrowers of funds from the financial system with gross payables to the tune of Rs 7.45 trillion and gross receivables amounted to Rs 56,000 crore till the period ending September, 2018. “A break up of gross payables indicates that the highest amount of funds were received from the schedule commercial banks (SCBs) followed by AMC-MFs and insurance companies. The share of SCBs has been growing for the last few quarters,” the report said. Moreover, housing finance companies were the second largest borrowers of funds from the financial system with gross payables around Rs 5.68 trillion and gross receivables of Rs 41,200 crore at the end of September 2018. In the case of NBFCs and HFCs, long-term loans, long-term debt and commercial papers were the top three instruments through which they raised funds from the financial markets. Also, following global cues of replacing unsecured inter-bank markets with secure funding line, size of the Indian inter-bank market has seen a continuous decline over the last few years as a proportion of total assets of the banking system. Fund-based inter-bank exposures have declined from 4.6 per cent to 3.8 per cent of the total bank assets. However, on the contrary, banks which were big lenders in the inter-bank market, are now lending a greater proportion to NBFCs and HFCs, the report further mentioned. Public sector banks continued to be the biggest player as a group in the inter-bank market with a share of 53.1 per cent, followed by private sector banks at 31.1 per cent and foreign banks at 15.8 per cent at the end of September 2018.